We’ve been fortunate enough to have a Medicaid card for Drew’s disabilities to help offset the cost of Drew’s significant medical expenses. Though this service doesn’t cost us dollars and cents, it does cost a lot of effort and labor. I have been tasked with documenting every interaction with a medical professional between July 2011 and July 2014 to determine re-eligibility including doctor name, address, telephone number, dates, and reason for visit/what was done. For the average child, this may not surmount to many notes, but for Drew it has culminated into a 16-page and growing document containing the names/offices of 23+ doctors/professionals and 345+ individual dates of visits. This means that on average Drew has seen a doctor or medical professional about every three days for the last three years….or twice a week…or 10 times a month. People often have said that I deserve a medal for all that I’m capable of dealing with and I always modestly deny it, but the after the dozens of phone calls I’ve made, people I’ve harassed, medical records I’ve gone through, research I’ve completed to compile this list, damn it, I DO want a medal!! All kidding aside, Drew has really come really far in his six years. His biggest transformation happening this school year. Just yesterday, Drew finished his last day of Kindergarten and is now officially a 1st grader. The school hosted a graduation ceremony for the kiddos. At first, I thought it was a little grandiose to have a graduation ceremony for six-year olds. Isn’t that kind of like getting a trophy just for showing up? But, I found myself excited as I watched Drew walk across the stage to accept his certificates. What a year for Drew. He started Kindergarten not able to walk on his own. He used a gait trainer and a wheelchair, but was mostly dependent on others. 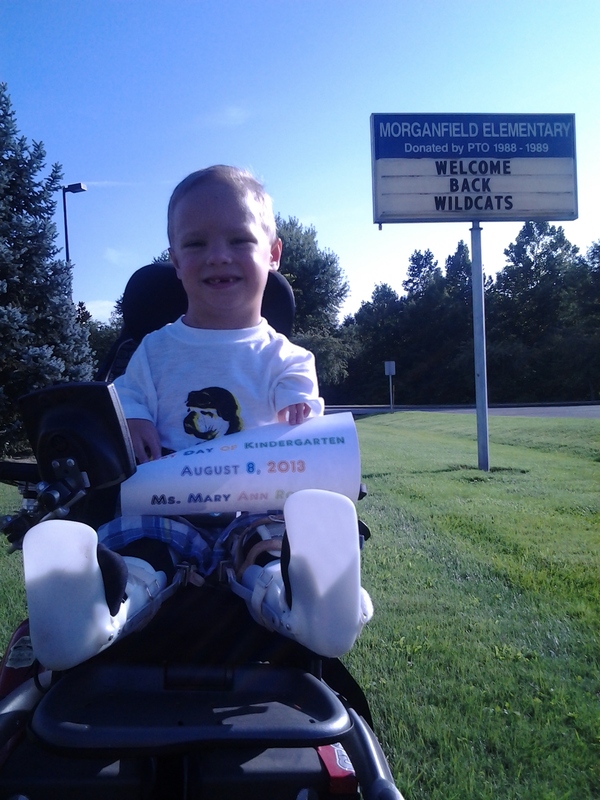 He was even just a couple of weeks off having open heart surgery on his first day of school! Drew very much enjoyed Kindergarten. He excelled in all areas earning praise for his handwriting skills (against all odds! ), exceeding the expectation of # of sight words to recognize, and most AR points. He is ecstatic to be in the first grade and I can’t wait to see how he blows us away with his accomplishments in the coming year. Do you want to see photos from Drew’s Preschool and Kindergarten years? Click Drew’s graduation photo above. On an unrelated note, we’ve been on quite the escapade for new braces. His current braces were made in Florida and a year or more old so Drew has outgrown them. I think they have been the source of all of Drew’s episodes of extreme pain and discomfort. So, I managed to find a pediatric orthotist in Louisville and we had a meeting to fit him for new braces which included taking a quick mold of each leg. Despite being told it would take two- to three weeks, we waited almost SIX weeks for the braces and my patience grew thinner each passing day as Drew’s pain continued to disrupt sleep for both of us and Drew’s gait appeared to changed unexplainably. At some point during our wait, we were no longer able to fit Drew’s hip piece and had to discontinue locking his knees because it was so unbearably painful due to misalignment from outgrowing them. Dr. Paley had put the fear of God into me about locking those knees to prevent a reoccurrence of Drew’s malrotation so I was an anxious ball of worry having gone so long without locking his knees. Meanwhile, the orthotist kept delaying the final result. Finally, with some persistence, and some may say bitchy-ness, I forced their hand and they rushed the shipment of the braces to the office. We finally received Drew’s braces, only to discover a day later that there is a major problem with them that I failed notice. So, we have to return to Louisville AGAIN next week to have it repaired and lord knows how long it will take to get these modifications made. However, this drama has taught me a lesson: I must ensure that the next orthotist is capable of making the braces in-house instead of shipping off to a third-party. And, Drew is having his tonsils and adenoids removed via surgery in 10 days down in Nashville. Not a good way to start the summer! !